Disney Caribbean Beach Resort sometimes gets a bad rap for being the oldest Moderate resort or for being huge/spread out. While this is true, I think Caribbean Beach has a lot of strengths, including an incredible pool complex and recently refurbished rooms. 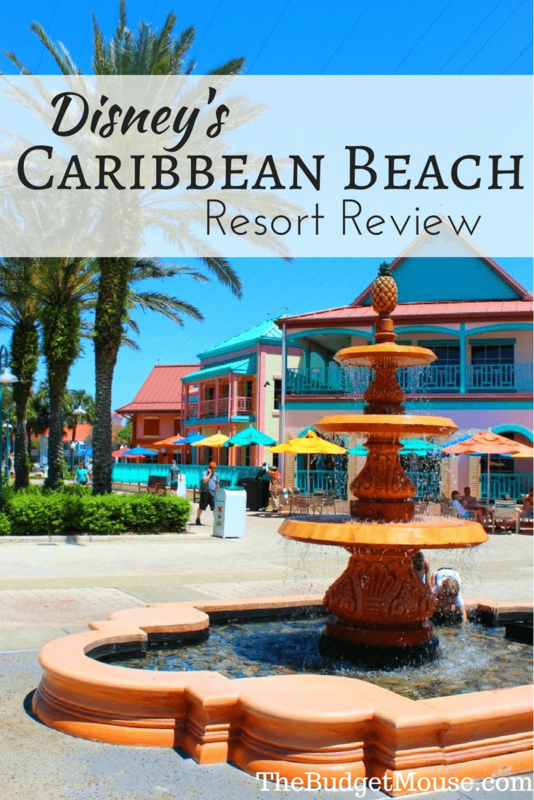 In this post, I’ll share my Disney Caribbean Beach Resort review as well as the pros and cons of the resort! 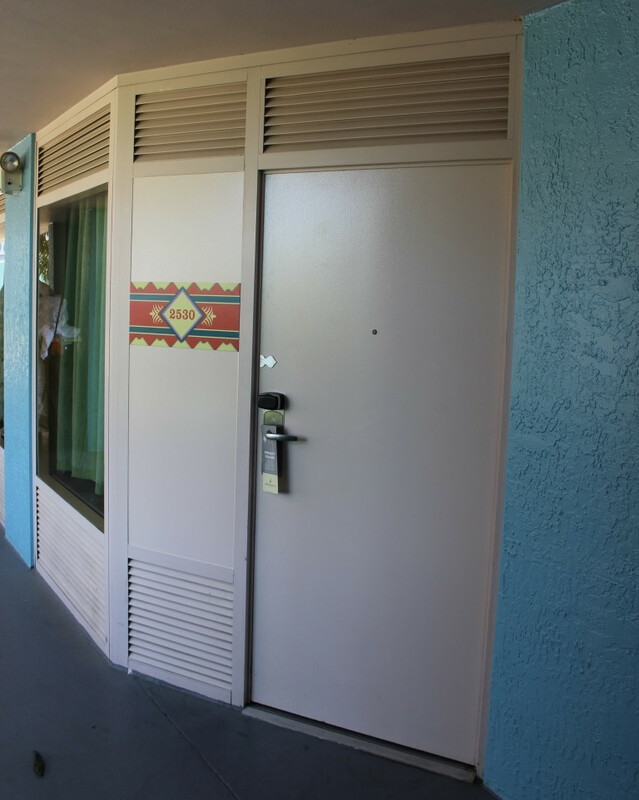 It took me MANY visits to Walt Disney World until I stayed at Caribbean Beach, and here’s why: up until 2016, it was the only Moderate resort that still sported double beds as opposed to queen beds. 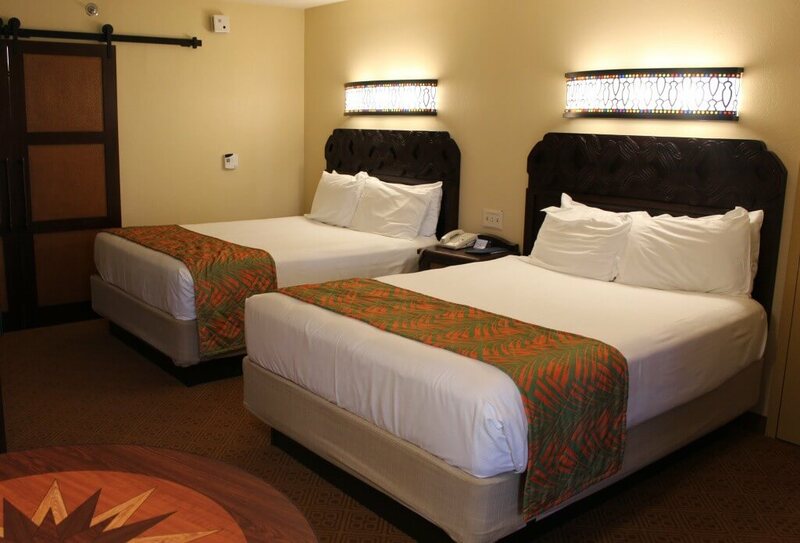 All rooms except Pirate-themed rooms at Caribbean Beach now have two queen beds (and some even sport an additional single Murphy bed!) so you will have plenty of room. Instead of making you wait until the end of this (kinda long) review for the pros and cons of the resort, I’ll share them now and explain as I go along. Is a stop on the gondola system to open in fall 2019! 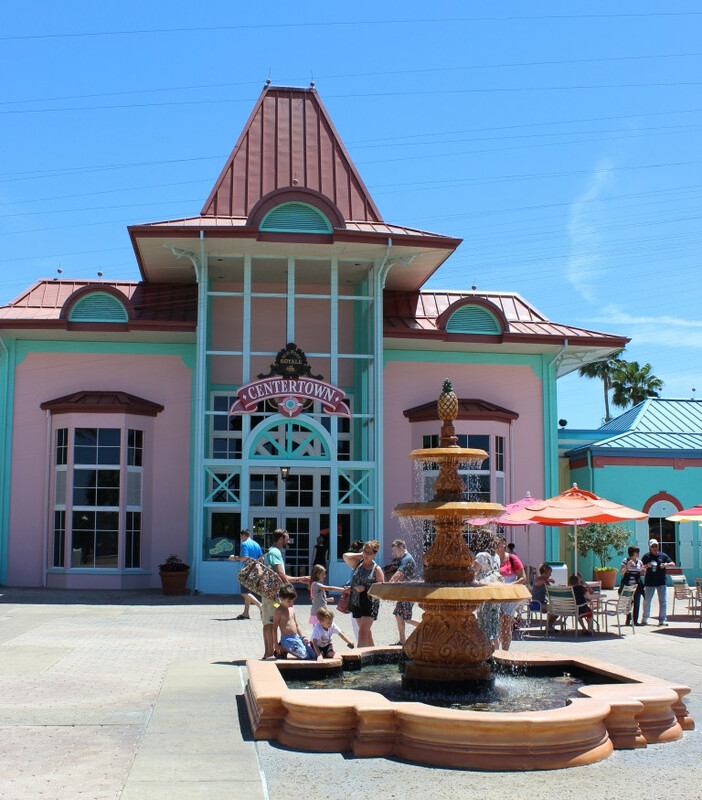 NOTE: Caribbean Beach has undergone a major renovation of its dining options and check-in location. I’m heading back next month to update my review with everything new! Now I’ll share details on every aspect of the resort and explain my list of strengths and drawbacks as I go. Let’s start with the rooms! 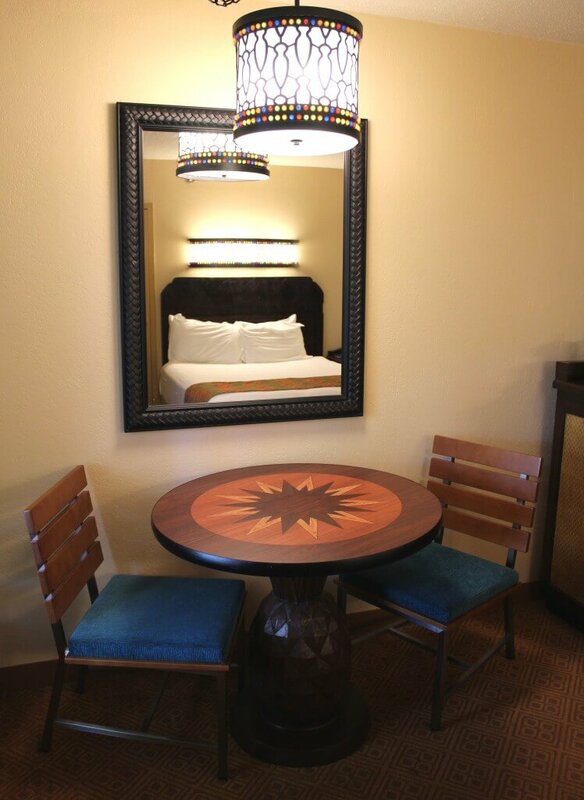 All rooms at Caribbean Beach (with the exception of the Pirate-themed rooms – more on those soon) received queen beds and all new furniture, fixtures, and soft goods in 2016. 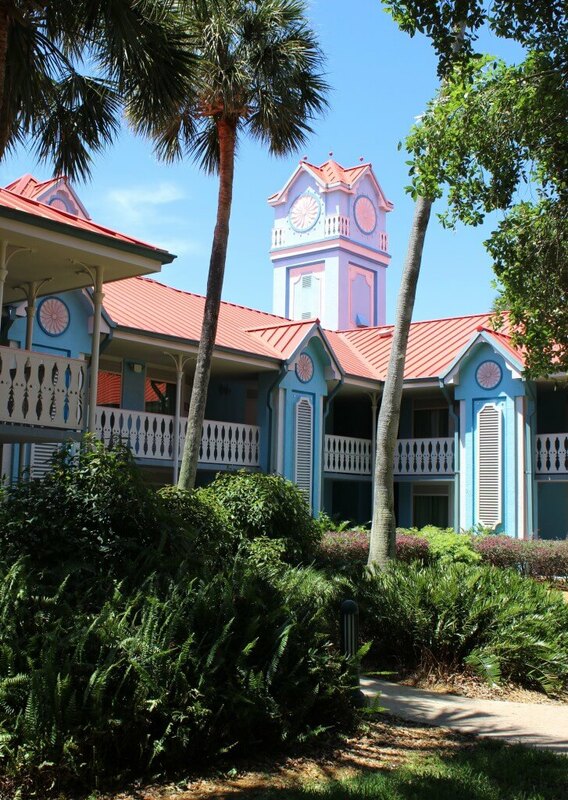 The buildings at Caribbean Beach are only two stories tall but they do not have elevators. This is important to note if you are traveling with strollers, wheelchairs or scooters. If you are, make sure you confirm that you have been assigned a ground floor room at check-in. 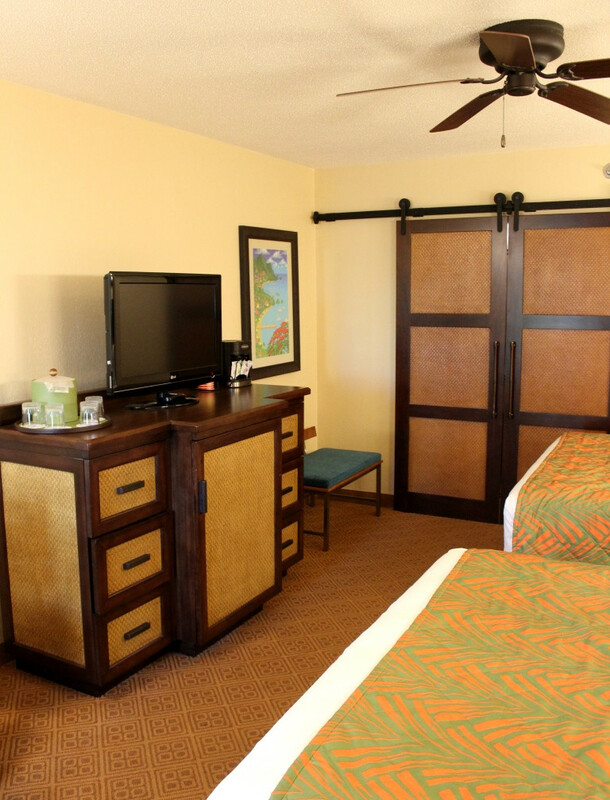 You access the rooms via outdoor walkways, similar to all of the other Moderate resorts. I really enjoyed everything about the new rooms. 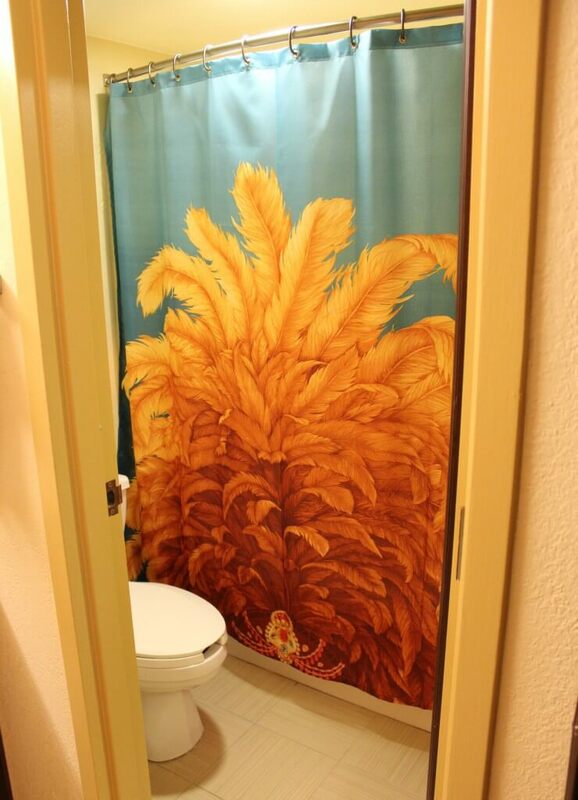 The decor was modern and understated but still had a Caribbean vibe. The queen beds were comfortable and the room seemed larger than most Disney rooms to me, likely due to the fact that the resort was built in 1988. We were able to fit two strollers plus all of our stuff in the room and still had room to move around. Our room had a small table with two chairs, a storage unit with drawers, a small coffee maker, a mini-fridge, and a bench located to the right of the storage unit. I was actually expecting the room to have a fold-out Murphy bed in the storage unit. But it turns out that every room didn’t get a fold-out bed to sleep a fifth person, so if this is important for your party, be sure to request one (learn how to make room requests in this post). If you have five people in your party you will be guaranteed one of these at the time of booking. My favorite feature of the room was the heavy rolling wooden doors that separate the bathroom area from the main room. My nephew was one year old and our plan was to put his Pack ‘n Play in the bathroom area and close it off from the main area with the doors during nap time and at night. Unlike many aspects of most vacations, this actually worked like a charm! He never woke up from noise from the main room and the Pack ‘n Play fit perfectly under the shelving once we moved the ironing board. The heavy doors essentially made a second room for him to sleep in, which was great considering there was also a three-year-old in the room! 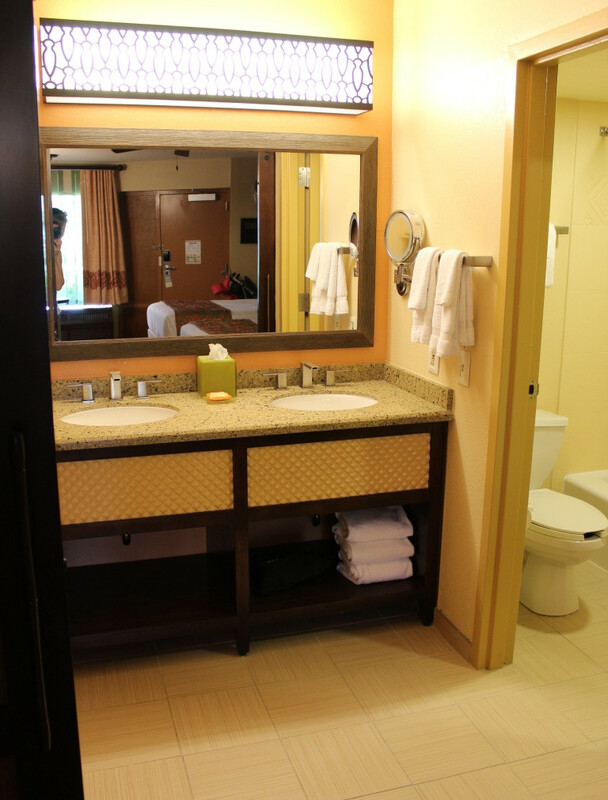 The bathroom area contained two sinks and a separate (and really tiny) room with a toilet and shower. My only complaint about the room was how small the sink/shower area was. Is was hard to maneuver in that space, especially when I was giving both kids a bath. Wait, I lied, I have one more complaint. I could not for the life of me find a single hidden Mickey in this room! Maybe I just didn’t find them, but I was disappointed that Mickey didn’t make it into the refurbished rooms. 🙁 Please leave a comment if you have found one! 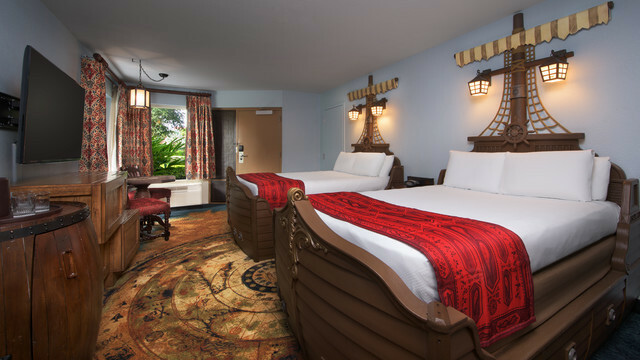 Now about those Pirate rooms… The Trinidad South area of the resort contains rooms that are heavily themed to the Pirates of the Caribbean. These rooms have two double beds and cost around $55 more per night than a standard room. Be warned that they are some of the furthest rooms from the dining and main pool, which is a deterrent for some folks. But if you have a pirate-crazed little one, these rooms might be worth the extra walking and cost. 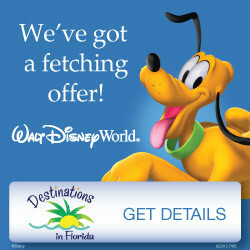 If you want help deciding on the right resort and room for your Disney vacation, I highly suggest getting a free quote from the agents at Destinations in Florida! 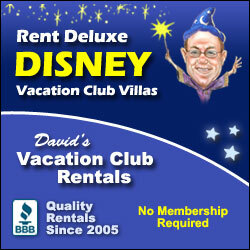 At no additional cost to you, they can help you with all aspects of planning your trip. One of the strengths of Caribbean Beach is that it is the most affordable of the Moderate resorts. Not only is its rate rack slightly lower (e.g. 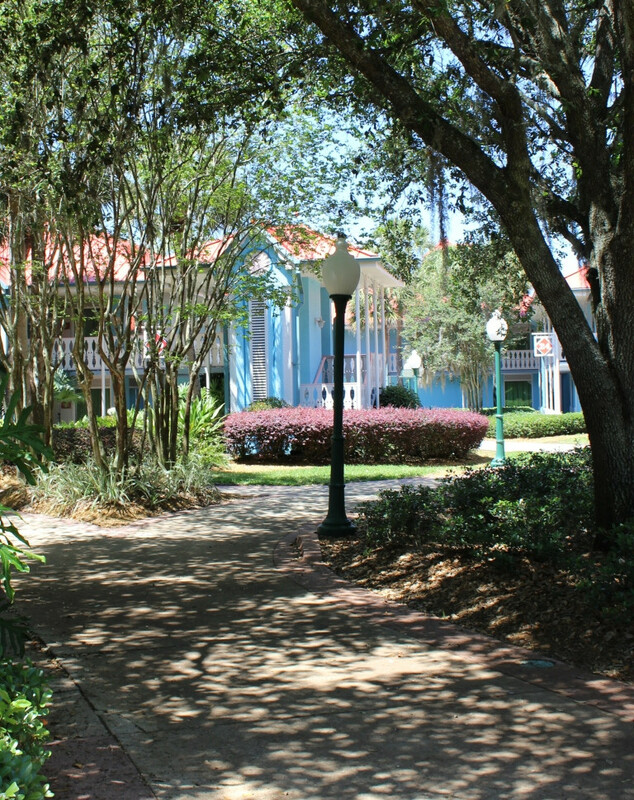 about $20 less per night than Port Orleans Riverside), but you can also often find discounted rooms available at this resort when other Moderate resorts are booked up. Disney releases “room-only” discounts for most dates throughout the year, and I’ve never seen Caribbean Beach excluded from these discounts. 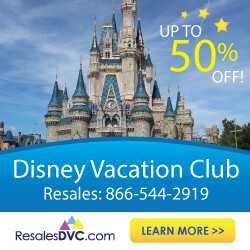 I always suggest booking room-only Disney reservation with Orbitz because you can stack these Disney discounts with promo codes from Orbitz to save even more (read all about how to do that here). I purposefully planned this trip to fall in the “Regular” season that begins after Easter and runs until the end of May. This is one of my most recommended times to visit Walt Disney World due to the great weather and lower rates. The rack rate during this time is $190 plus tax. You can read about how I paid $33 total for the entire trip in this post! As you can probably tell from the above picture, Caribbean Beach Resort is HUGE. 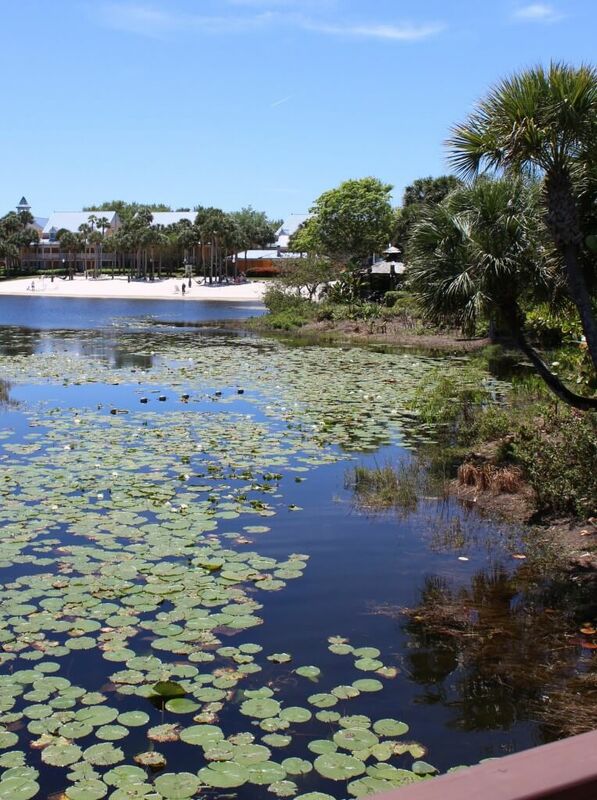 It is made up of six “villages” positioned around a body of water called Barefoot Bay. To give you a sense of scale, it is 1.2 miles around the main part of Barefoot Bay. 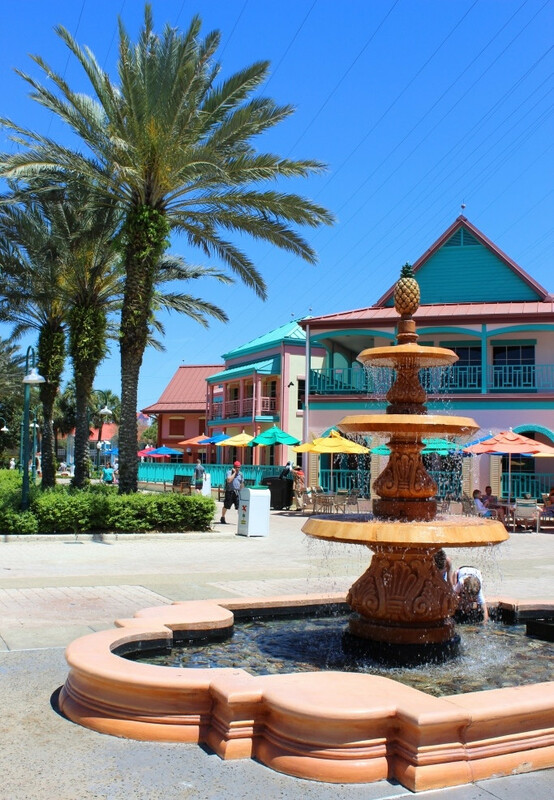 The Customs House will likely be your first stop when you reach the resort. It is across the road from the main part of the resort and contains the Check-In and Concierge desks, Airline Check-In and the Magical Express bus stop (this set up will change when the current renovations are complete in 2019). 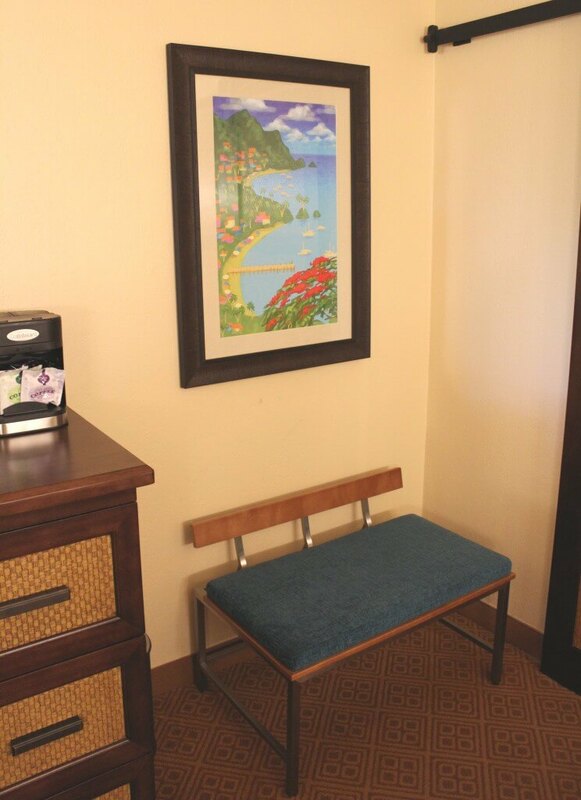 To get to your room from the Customs House, you can walk or take the bus that circulates internally at the resort. Because the resort is huge, where your room is located really matters! I always suggest adding a room request to your reservation 5-7 days before check-in (learn all about how to send room requests in this post). My requests usually include a ground floor room and being close to transportation. But on this trip, the most important request I made was to be close to the main pool and dining, since we would be spending most of our time at the resort. 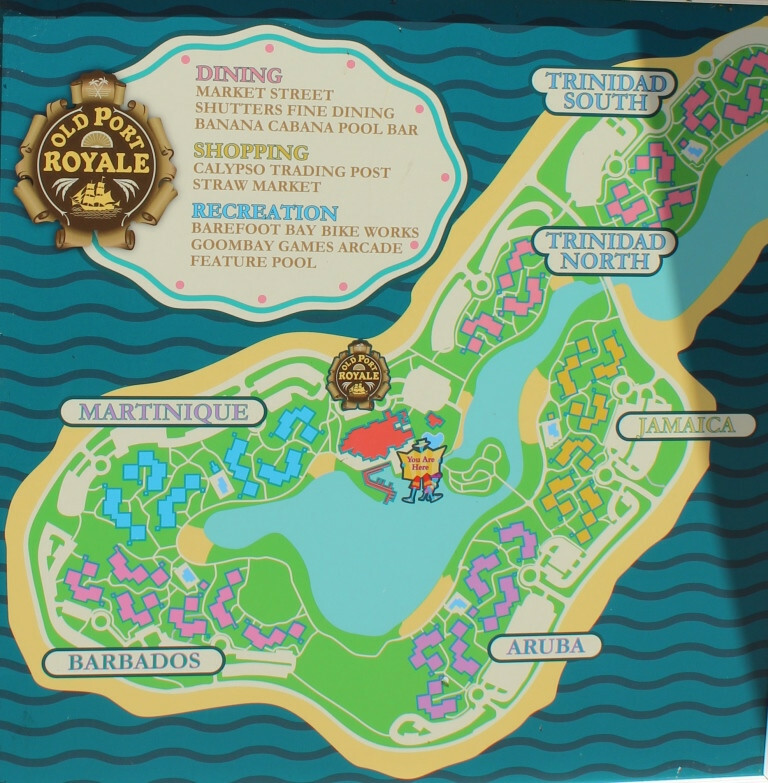 The main pool complex and dining are located at Old Port Royale, the area in red on the above map between the Martinique and Trinidad North villages. Because of their proximity to Old Port Royale, these two villages contain “Preferred” rooms, which cost around $55 more per night. You will hear many folks recommend spending the extra money to be close to the dining and pool, but I actually disagree. Some buildings in Jamaica and Aruba are actually just as close to the action via a connecting bridge. I suggest booking a standard room and in your room request, ask to be as close to Old Port Royale as possible. I did this, and we ended up in a Preferred room in Martinique about as close as we could possibly be to the food and pool! Though of course, this isn’t going to happen for everyone on every trip, the room assigners at Disney really do try to fulfill your room requests as best they can. If you ask nicely, you might even get a free room upgrade like we did. In my opinion, the grounds, architecture and theming at this resort are one of its big strengths. Each village has its own distinct feel from subtle design and color differences. There are beaches along Barefoot Bay in each village, complete with hammocks and palm trees. The pathways among the villages are shaded and beautifully landscaped. The vibe at this resort is laid back, tropical and uniquely Caribbean. I really enjoyed walking around the resort and checking out the different villages. 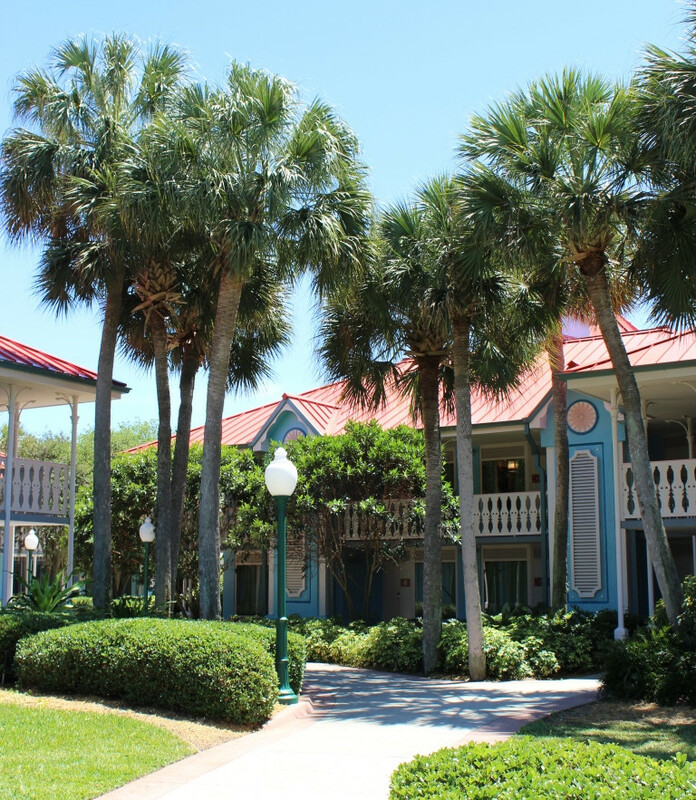 At over 200 acres, you could spend the better part of your vacation just exploring the resort! We decided in part to stay at Caribbean Beach because of how much there is to do here, and it didn’t disappoint. The kids played on the beach, swam in the pools, played on the playground, roasted marshmallows over a campfire, caught part of Frozen on a giant screen by the pool, and even watched fireworks from the beach. We ran out of time to do all we wanted to do at the resort, even after five days there and not going to the theme parks! Our little ones really loved playing on the beach closest to our building. I think they would have been happy spending hours here each day. Note that swimming isn’t permitted, and for your kids’ safety please keep them out of the water. There was a volleyball net set up on this beach, though I’m not sure how you obtain a ball. Cast members lead a campfire on the Martinique beach select nights during the week, and we liked that it was early enough that our little ones could participate without missing bedtime. I think it was at 5:30 pm one night, and 6:30 or 7:00 on the others. You can roast as many marshmallows as you want for free, plus you can buy S’mores kits for a few bucks. 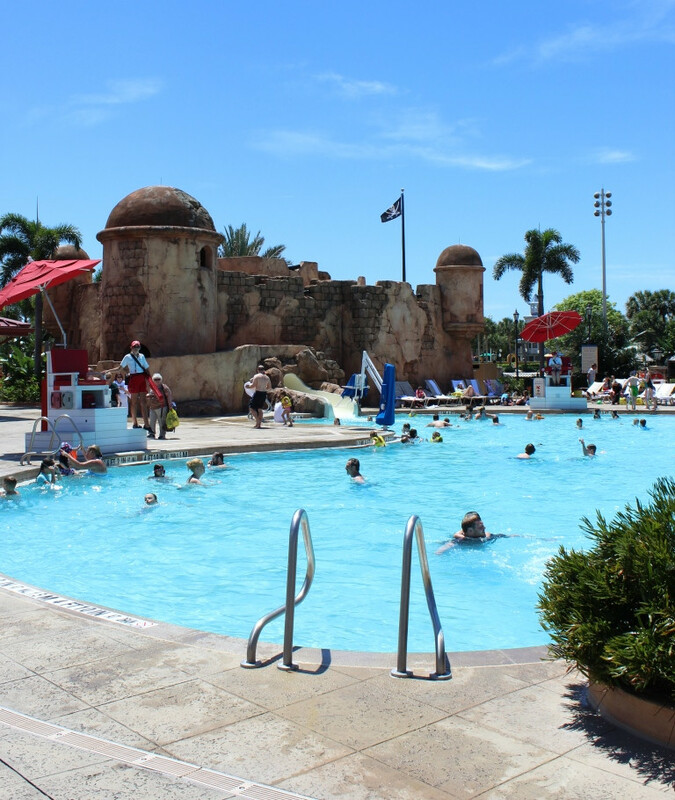 Pools are always a big attraction for us at Disney resorts, and this pool ended up being one of my favorites. 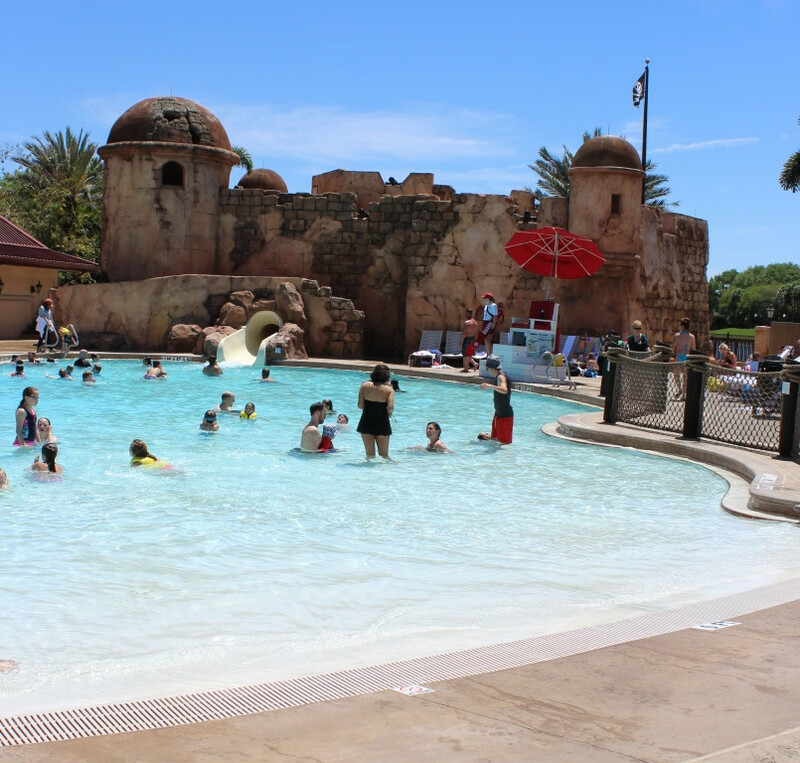 The feature pool is located at Old Port Royale and is called Fuentes del Morro (someone please leave a comment and help me with the translation). It is the only zero-entry pool at a Moderate resort and I thought it was a fairly large pool. I was mostly freaking out over how well it was themed to a pirate’s fort, complete with cannons, lookouts, hidden passageways, and iron bars over the windows. 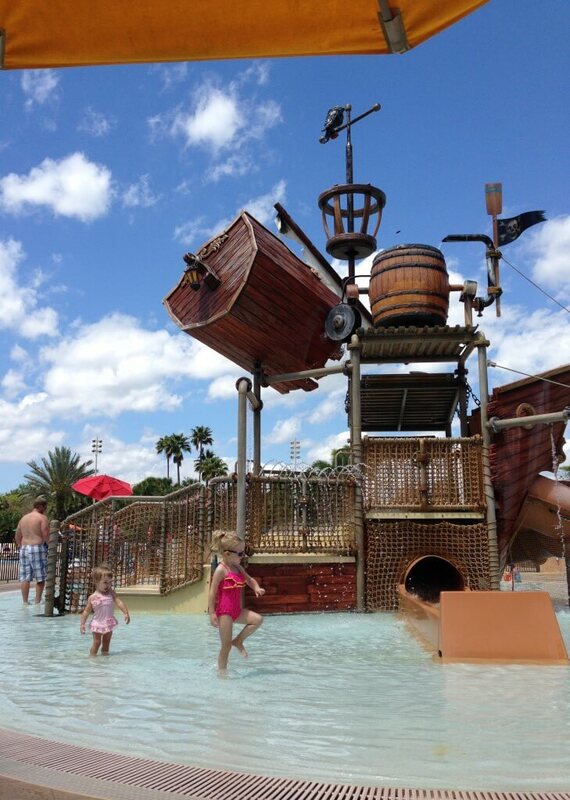 I told a friend that it was like the magic of Pirates of Caribbean at a pool (minus the musty water smell on the ride). Towels are provided at the pool so you don’t have to bring them from your room or home. 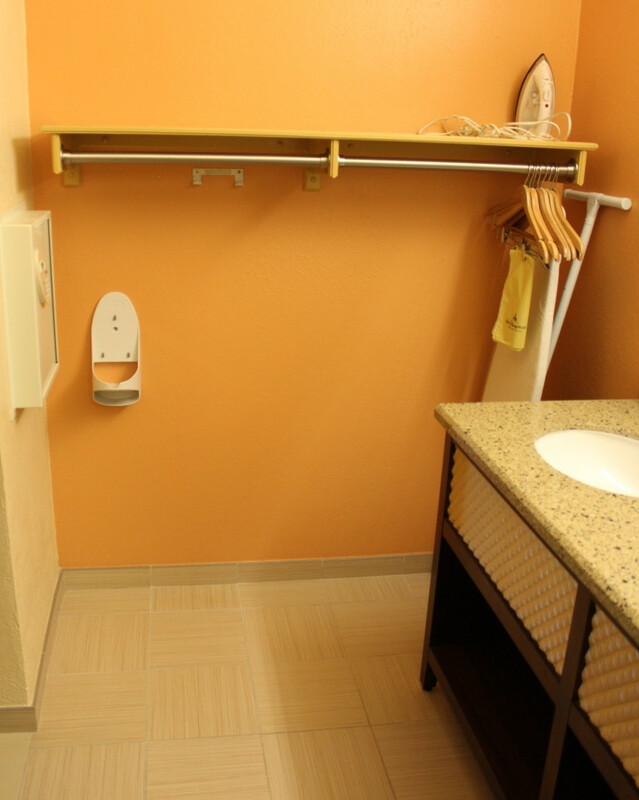 There are restrooms, showers, and lockers located in the pool area as well. 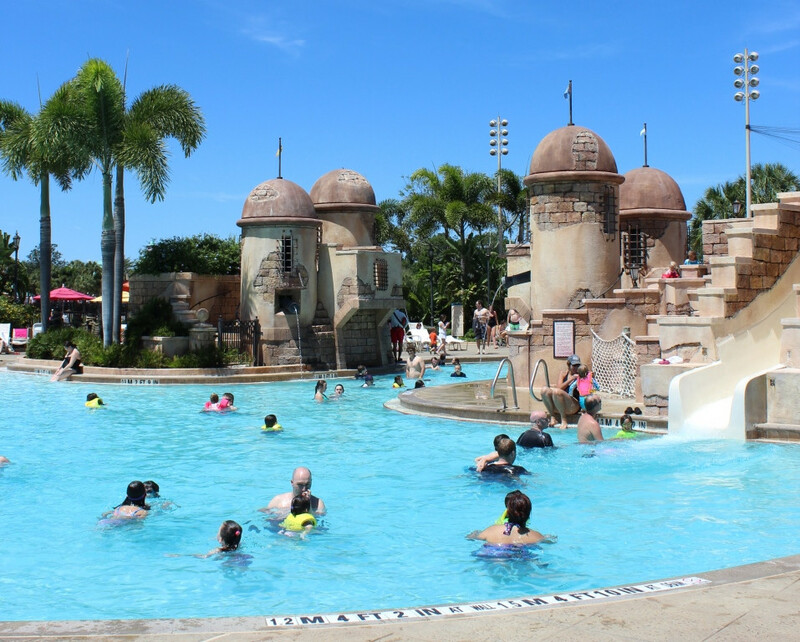 Two water slides empty into the main pool – a shorter one for the younger crowd and a 102-foot long slide that requires climbing to the top of the fort and sliding through the almost-total darkness. 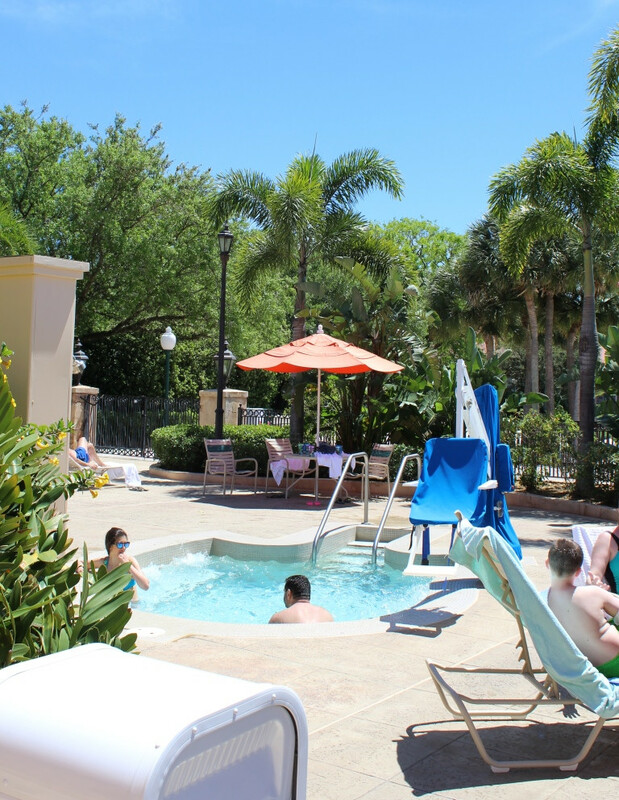 There are also two hot tubs in the main pool area along with a gated kiddie water play area. The shipwreck play area was a big hit with my three-year-old, though she had NO INTEREST in getting water dumped on her head (which happens every few minutes). There were a few slides and lots of room to splash and play for the little ones. 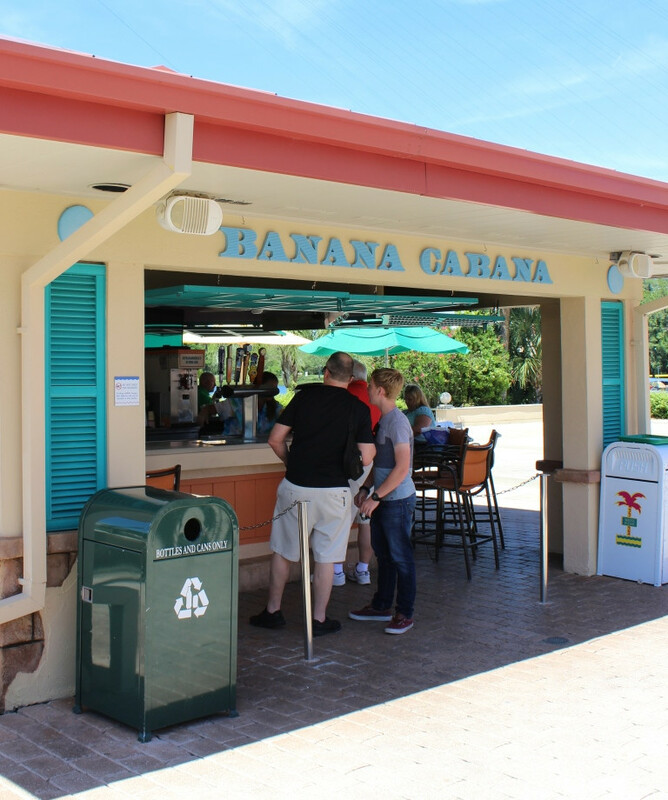 You’ll find the Banana Cabana pool bar right outside of the gated pool area (this has recently been remodeled and looks different). 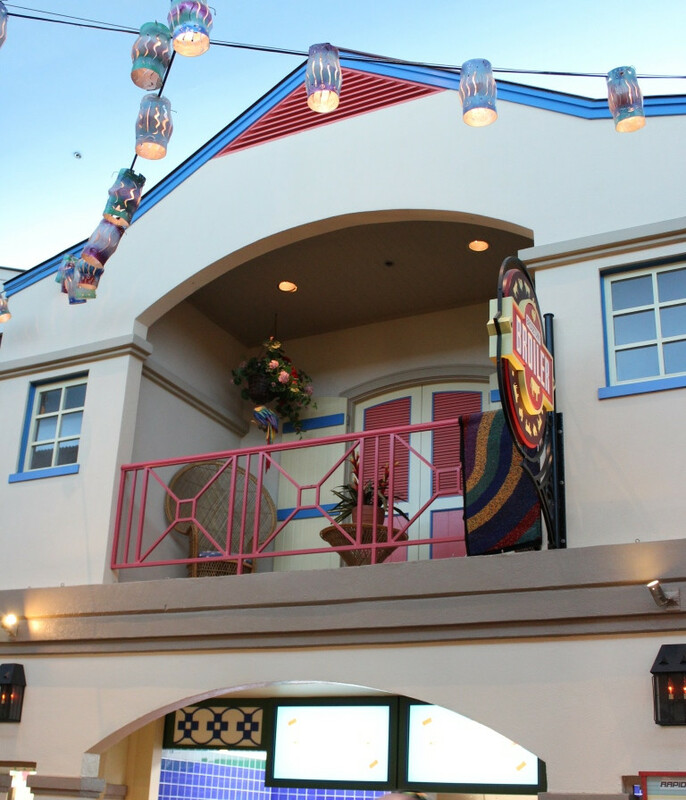 It serves standard Disney pool bar drinks and some specialty beer on tap, including one that is unique to the resort. There are six more “leisure” pools found around the resort, one in each village. We didn’t visit any but they all looked nice, though nothing to write home about. 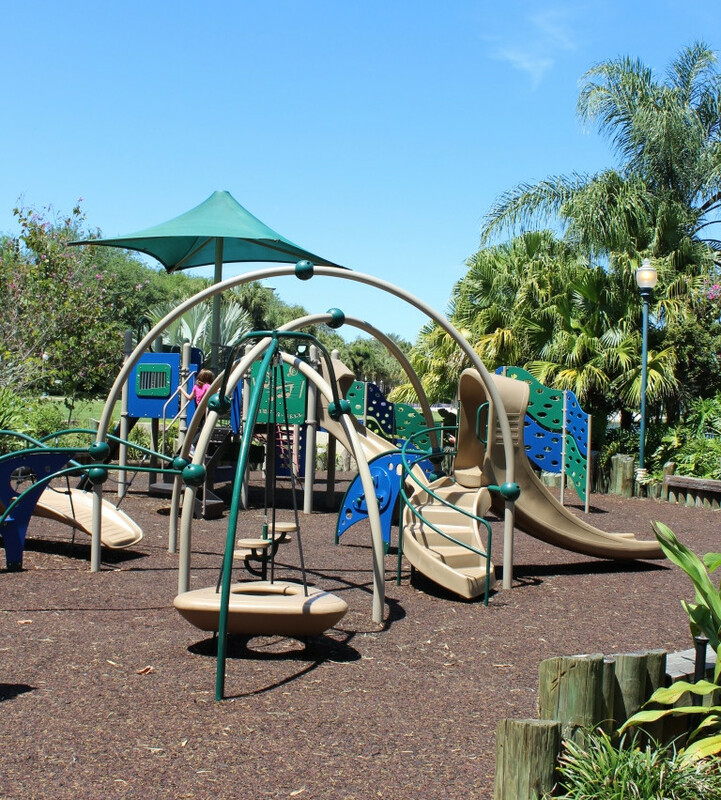 We also spent some time at the playground, which is located on the island called Caribbean Cay (FYI that’s pronounced “key”, just so you don’t look like a goober like I did) near the pool complex. It had lots of equipment for all ages and was never very crowded. 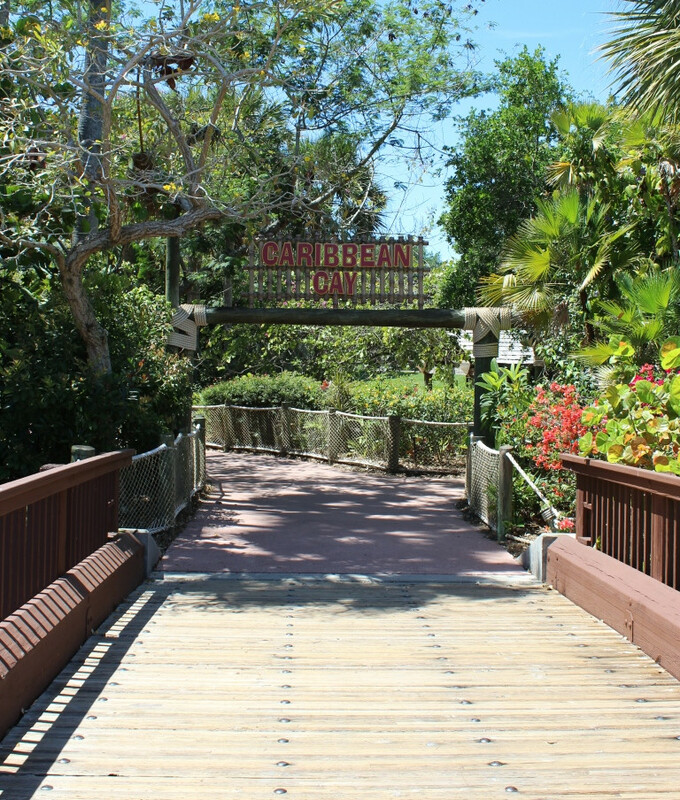 Like all Disney resorts, Caribbean Beach has daily recreation activities. 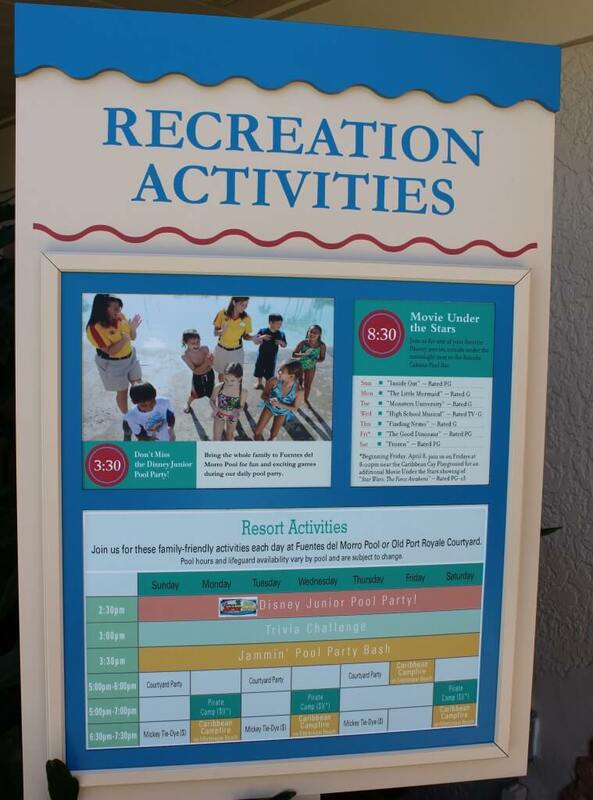 They were posted on this sign at the pool as well as in an Activities calendar you are given at check-in. We did catch a little bit of Frozen on a blow-up screen in the courtyard one night which was really fun. 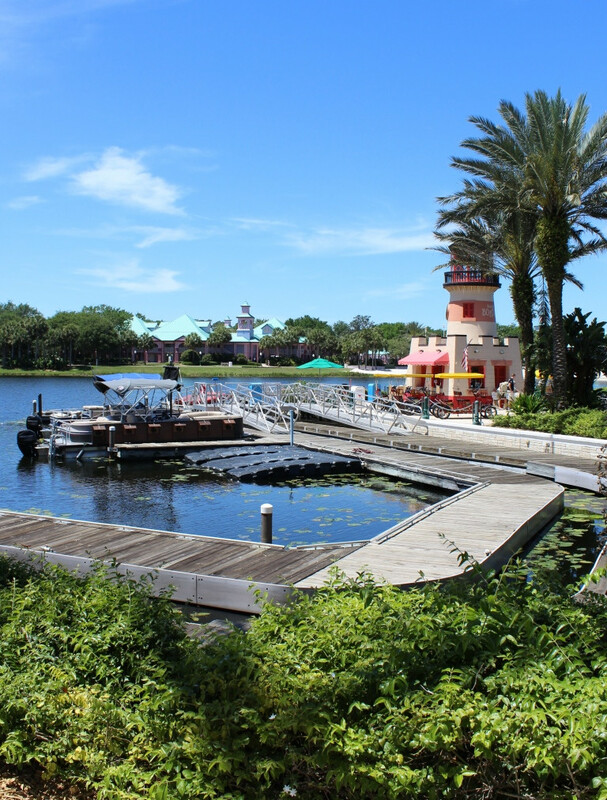 Finally, you can rent watercraft or bicycles at the marina near Old Port Royale from 10 am through around 4 pm each day. We intended to rent a surrey bike for a ride around the resort but ran out of time. Kids ages 4 to 12 can participate in a Pirate Adventure Cruise that leaves the marina on select nights at 5 pm. It lasts 2 hours, involves following clues to discover secret treasure, and parents aren’t allowed! It costs $37 per child and is a great chance for parents to have an evening for themselves. We ate at the quick service food court at the resort many times on our trip and the table service restaurant once. 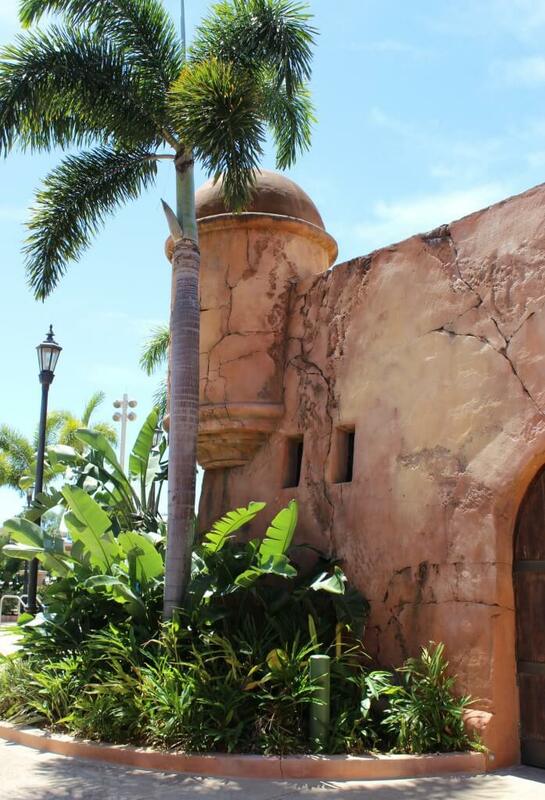 NOTE: Caribbean Beach is in the middle of a huge renovation of their dining facilities. Here is a link to all of the latest news on dining at the Disney Food Blog. I wish I had better things to say about the food but overall I was disappointed. I’ve come to have pretty high standards for food at Disney resorts (being a frequent visitor to Animal Kingdom Lodge) and pretty much everything I had at Caribbean Beach fell short of my expectations. Breakfast was fine, with standard Disney offerings like a Bounty Platter ($9.49) and Kid’s Mickey Waffles ($4.99). For lunch I had a uninspired Caesar Salad with Chicken ($8.99) but only because they were all out of their house Caribbean Salad. The 1/3 lb. Angus Cheeseburger with Fries ($11.29) was the smallest and most over-cooked burger I’ve had on Disney property. The best thing I had was the Blackened Mahi Sandwich with Mango Coleslaw and Fries ($10.49) but even it was dry and overall pretty tasteless. On the plus side, my sister had a better experience with her quick service fare, especially a vegetarian wrap she had for lunch one day and some salmon she had for dinner. The Centertown Market food court (view the current lunch/dinner menu at AllEars.net) has a nice atmosphere and I never waited too long for food. 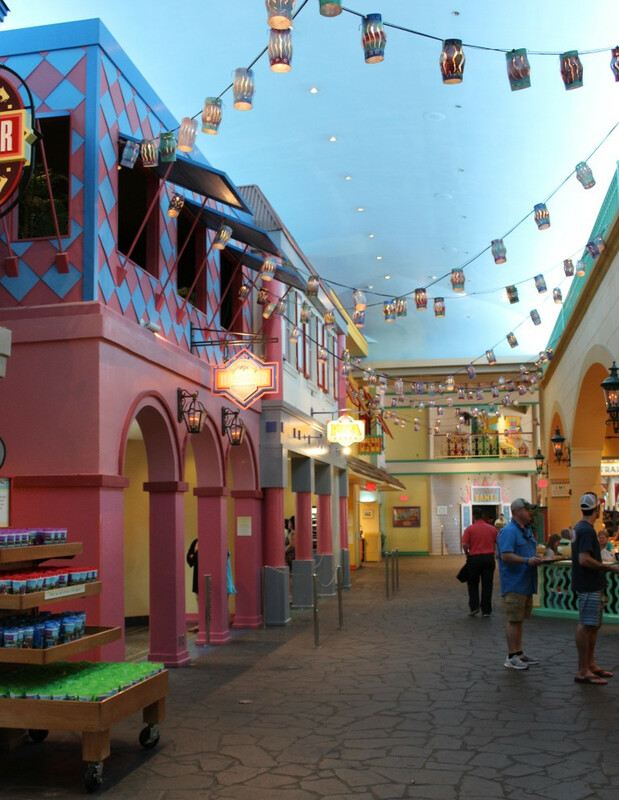 I especially liked the Disney touches that made you feel like you were really in a Caribbean marketplace. There was lots of seating both inside and outside, but watch for aggressive food-grabbing birds outside! We lost several french fries to them. 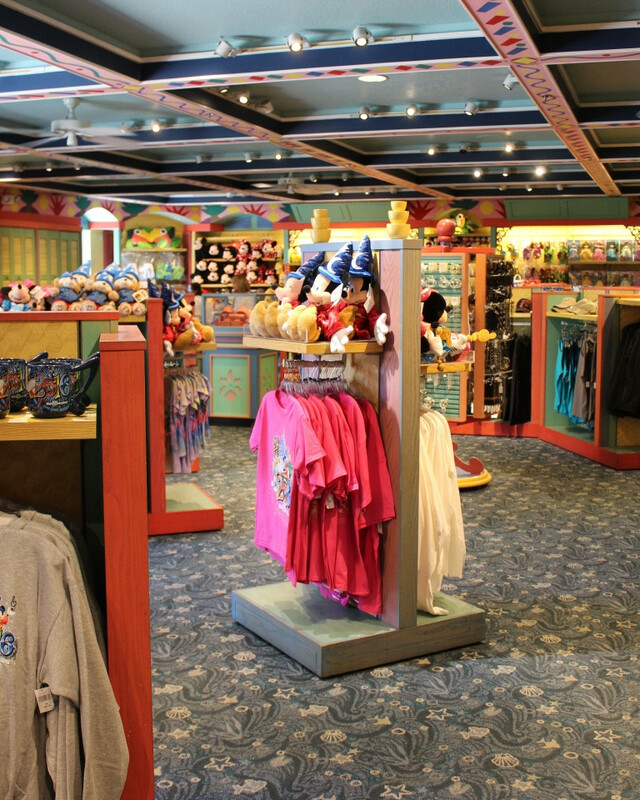 There is a large and fairly standard gift shop located in the same building as the food court at Centertown. In the very back of the store is a cooler with some basics such as half gallons of milk and snack food. Surprisingly the milk was just a little more than you’d pay at a regular grocery store, so if you have little ones that drink lots of milk, grab one to throw into the fridge in your room to save some money at the food court. The only way to get to the theme parks from Caribbean Beach is via Disney buses or car. Since the resort is so huge, there are six bus stops in the resort. That’s right, you will possibly stop up to five additional times before you reach the parks/return to your room. We had a pretty rough time with the buses on our trip and we only took them a handful of times. It took us almost an hour to get back to our room from Epcot one night. Granted we just missed a bus, had two scooters on our bus, and were one of the last stops back at the resort, but it was way longer than is acceptable to me. I normally advise taking Disney buses to the theme parks for the convenience and time that it saves. However, at Caribbean Beach, I would suggest driving to every park except the Magic Kingdom if you have a car available. Epcot would have been a less than 10-minute drive, and even with an additional 10 minutes of trekking to your car you still would have saved about 40 minutes in our situation. I still would recommend taking a bus to the Magic Kingdom because of the additional time involved in taking a ferry or the monorail to get to/from the parking lot. Transportation is a definite downside to this resort. But if you have a car with you, or aren’t visiting the parks much, then you can work around this and still have a great stay. Disney’s standards of excellence for its cast members are in full effect at Caribbean Beach. We had nothing but positive interactions with everyone there. Our little ones received a princess wand/pirate sword at check-in and adorable pirate rubber duckies when we went back to the Customs House to add my sister’s credit card to her Magic Band. We left some items in our room (including my Kindle… cringe) and a member of the Mousekeeping staff collected them for us and shipped them back to me at no charge. Disney sets the bar so high for guest satisfaction that it makes it hard to vacation anywhere else. 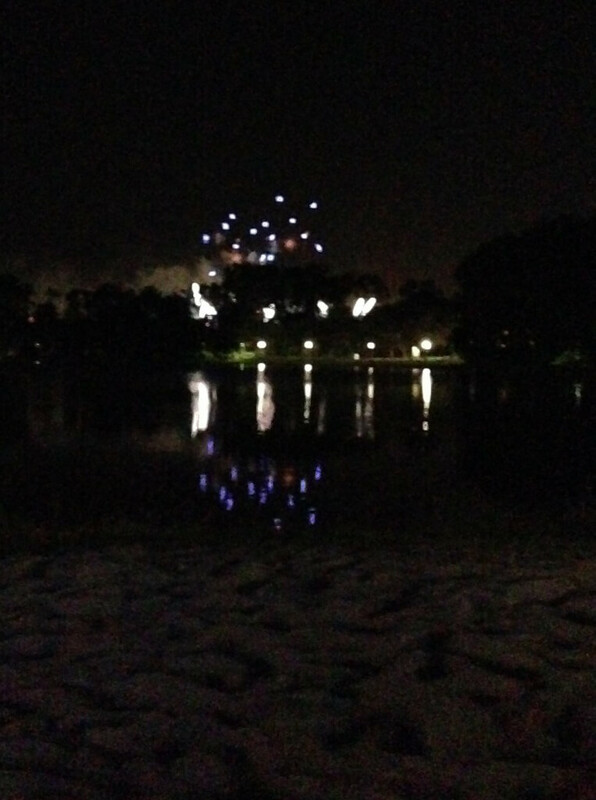 We enjoyed watching fireworks from both Epcot and Hollywood Studios from the beach outside of our room. However, the noise from the fireworks was so loud in our room that it sounded like they were directly outside. This might have had something to do with the orientation of our room (facing the water and parks), so if this is going to be problematic for you then request a room facing away from both. We didn’t have any other trouble with noise in our room until our last night when what sounded like a family of twelve descended on the room next to ours and made tons of noise until past midnight. I’ve read complaints about paper-thin walls and noise in the rooms at Caribbean Beach, so I thought I should mention our experience. Overall, we had a fantastic stay at this resort. I had to physically remove my little one from the pool when it was time to go home because she was having so much fun. I would definitely return to Caribbean Beach to enjoy the rooms, pools and grounds, this time armed with knowledge about the lackluster food and transportation. 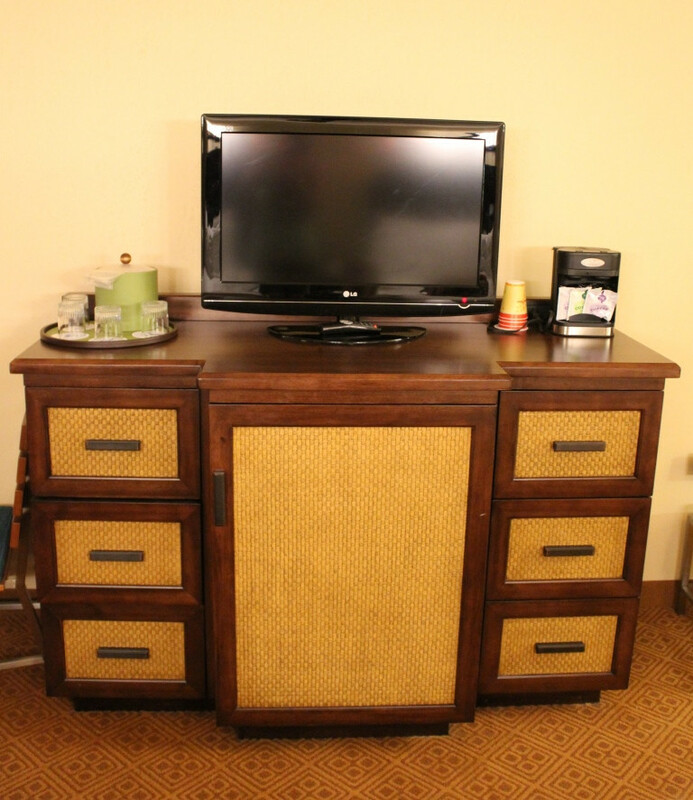 Any questions about my Disney Caribbean Beach Resort review? Leave a comment below or send me a message on The Frugal South’s Facebook page! 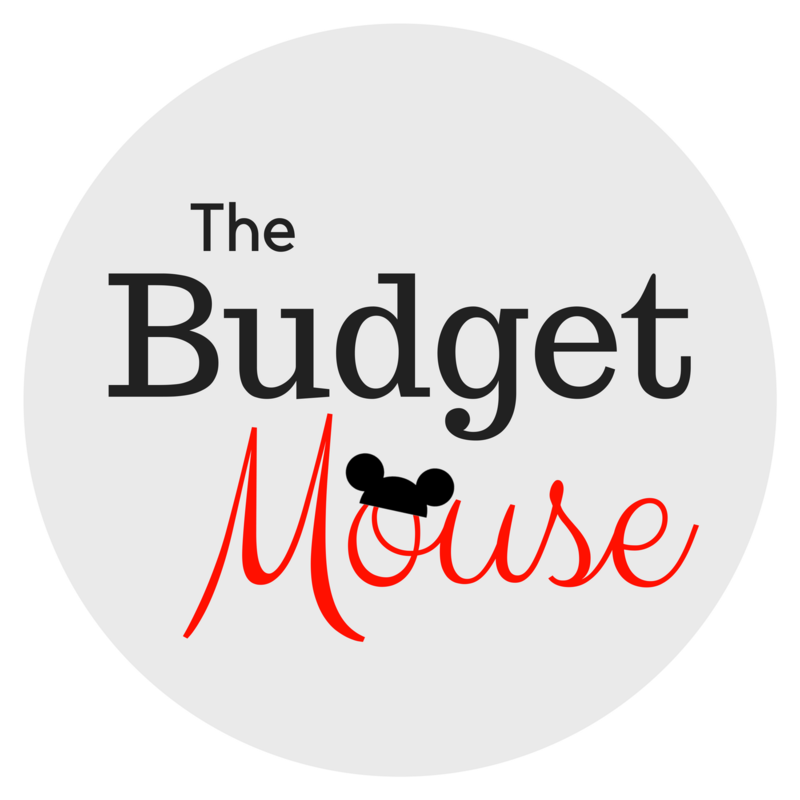 Introducing My New Disney-Only Site, The Budget Mouse! Glad I read this! 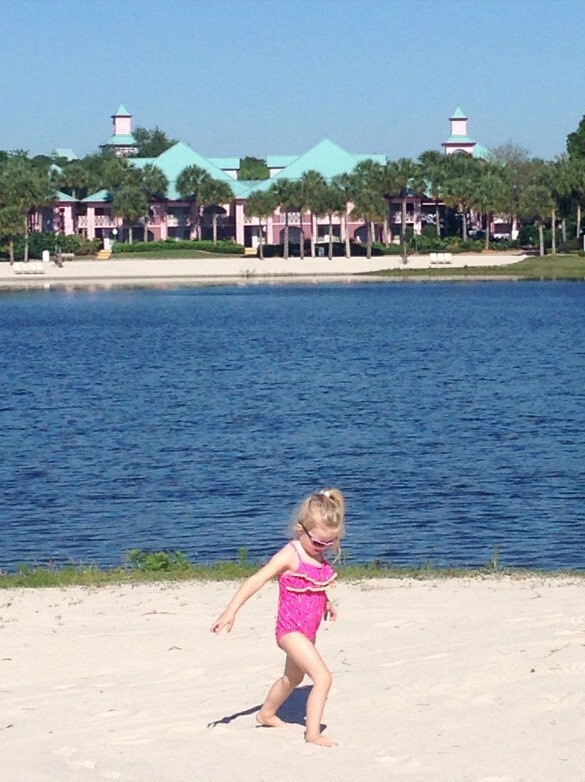 We try to stay at a different resort every time we visit, and Caribbean Beach Resort was next on our list. But after reading this review, it’s now going to be relegated to the “don’t stay here” list. I can’t believe in the year 2019 that a resort at this price point wouldn’t have elevators! Even the value resorts have them! And I know you said to request a ground floor room, but unless it’s guaranteed (which it won’t be), it’s not a risk worth taking. I can’t do the stairs so if there’s no elevator and we’re on the 2nd floor, we’ll find ourselves in Florida without a resort to stay at. When we went to Disney’s All Star Movies 3 months ago, I requested a room as close to the lobby & transportation as possible. I was even paying for a preferred room so it wasn’t like I was asking for something I didn’t want to pay for. I explained that I’m disabled & can’t do a lot of walking. By the time we get back from the parks, I can barely walk. Our room was on the 2nd floor as far from the lobby as possible with still being a preferred room. Thanks for the review. We are staying here at the end of the year with a 5 and 2 year old. I was worried about how we can fit the pack and play for the 2 year old who is a light sleeper. Feeling very reassured after reading that we can set her up in the closet. 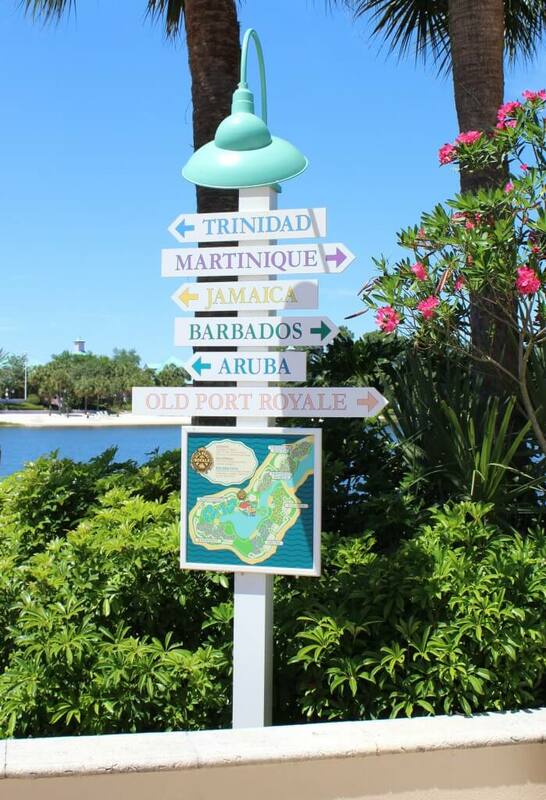 Do you have approximate walking times from different places in the resort to the main pool and dining? I keep hearing how big it is but trying to get a realistic understanding. That’s great. Lauren! Yes, you will be able to fit the pack n play in the bathroom area, though we did have to move the ironing board out of the way. We stayed in a preferred building that was one of the closest to Town Center. It was still a five minute walk to the food court and pool. It was a 10+ minute walk to the Customs House from our room. If you were in one of the rooms that was farthest away from the pool and dining I estimate you would be looking at a 15 minute walk. It really is a huge resort. I suggest adding a request to your reservation to be as close as possible to the main pool and dining. If you did this I am sure you would be a 5-10 minute walk away. Hope that helps!